Views at Fall Creek Falls. 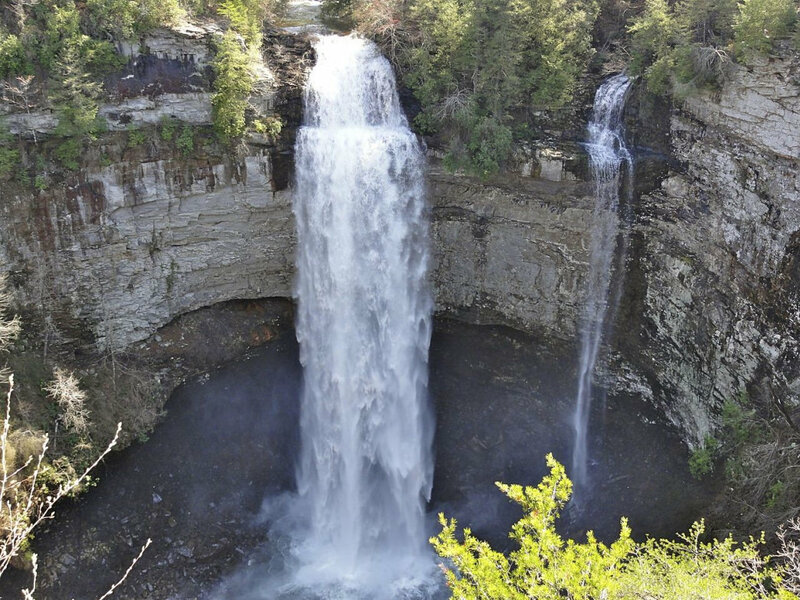 The largest state park in Tennessee also has one of the tallest waterfalls in the eastern U.S., three distinct bike paths with an array of difficulty levels, and a wonderful view of Cane Creek Gorge. In total, the park offers 27.5 miles of mountain bikeways, split into 3 different trails: a 6-mile out-and-back, an 8-mile out-and-back and a 13.5 mile single-track. A trio of bike trails (two out-and-back, one single-track) gives intermediate-level riders some variety, but all share a moderate level of intensity. The park is open year-round and hosts seasonal events for the public throughout the year, including the winter holidays. Fall Creek Falls is a 26,000-acre outdoor wonderland with four major waterfalls (including the tallest free-fall waterfall east of the Mississippi) and plenty of ways to enjoy its vast wilderness. Visitors can stay overnight in an array of accommodations—camping, renting a cabin or staying at the inn—but even for those who just want a moderately challenging mountain bike ride, plenty of options await. With three trails from which to choose (plus a few paved paths to get to other parts of the park as well), you do a quick six-mile out-and-back, spend a few hours challenging yourself on a 13.5-mile trek, or split the difference on an eight-mile out-and-back ending next to a gorge. For a moderately difficult, but serene, ride through areas of the park that aren’t too highly trafficked, check out the Chinquapin Ridge Mountain Bike Trail. This six-mile, out-and-back doubletrack starts near the Newton Ford Picnic Area, and has some medium inclines and descents as well as several creek crossings. It runs through a part of the park not frequented by many visitors, making it a great introduction for an intermediate-level mountain biker wanting to get away from it all for a little while. Next up is the Piney Mountain Bike Trail, an eight-mile, out-and-back doubletrack that departs from the Group Camp 2 gate and leads downhill across Piney Creek. Concluding near the rim of Cane Creek Gorge, the tall pines make for a cool, shaded ride through rustic surroundings, where you may occasionally find logs on the path to jump over. For a longer ride requiring a good bit of persistence, the Upper Loop Trail offers some delicious twists and turns to test your acuity, as well as some open sections that provide a bit of relief. Climbing over hills with some decent climbs and a handful of rocky segments, the 13.5-mile ride is singletrack, and accessible from the northern entrance to the park. While none of the trails are particularly well-suited for beginners, the Chinquapin is a good test for a less-experienced rider ready to take things to the next level. All three trails are perfect for casual but experienced mountain bikers who don’t mind a few challenges along some gorgeous, quiet trails through an otherwise popular area. With the variety of other activities available in the park, many suitable for children, Fall Creek Falls is a great option for families or groups with one or two people who want to put their tenacity to the test while the rest enjoy a casual paved or natural hike, a simple picnic, or a stroll through some historic Appalachian structures, including a working grist mill. The park is accessible via TN-284 from both the southwest and northeast; once inside, designated parking areas are clearly marked. If you’re riding the Upper Loop Trail, it’s best to use the north entrance where the park’s headquarters were originally located.